Today we are making a preview of Azure Container Service (ACS) available to our customers. ACS is an Azure Compute resource provider to create and manage a cluster of virtual machines that act as container hosts together with a number of "master" machines that are used to orchestrate your application containers. ACS provides an optimized configuration of popular open source scheduling and orchestration tools that enable you to use your existing skills to deploy and manage container based applications on Microsoft Azure. 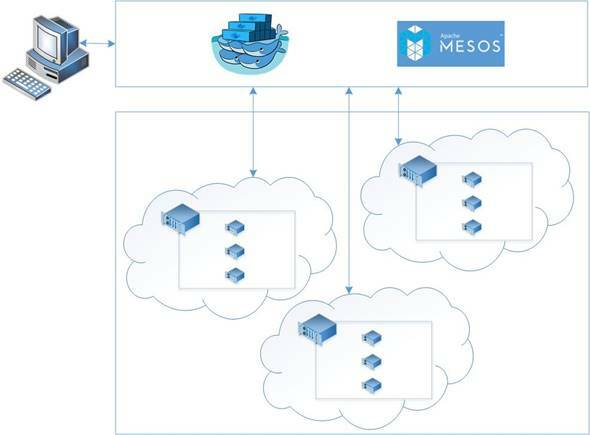 As we shared in September, this preview builds on our work with our partners Docker Inc. and Mesosphere to deliver a production ready container service based on Docker, Apache Mesos and open source components from Mesosphere's Datacenter Operating System (DCOS). Together we have engaged with the open source communities to ensure that we can run these workloads optimally on Azure without compromising application portability for our customers. This work continues and we look forward to further enhancing this service in the future. During the initial stages of preview we ask that those interested self-nominate and we'll follow up with you by email. Note, you will need an Azure Subscription, if you don’t have one yet then why not sign up for a free trial? Our goal with the Azure Container Service is to provide a container hosting environment using open source tools and technologies that are popular among our customers today. To this end we expose the standard API endpoints for your chosen orchestrator. Using these endpoints you can leverage any software that is capable of talking to those endpoints. For example, in the case of the Docker Swarm endpoint you might choose to use Docker Compose, while for Apache Mesos you may choose to use the DCOS CLI. This approach provides for maximum flexibility and portability for your applications. By way of example the video below demonstrates how we use Docker containers and Docker Compose on a developers machine, coupled with a Azure Container Service using Apache Mesos as the orchestrator for our test cluster. As an added bonus the video shows how Jenkins can be used as a CI/CD server so that when a developer commits code to the source code repository it is tested and deployed in the ACS cluster. At this time the service supports Linux containers only. Microsoft has committed to providing Windows Server Containers using Docker and Apache Mesos is being ported to Windows. This work will allow us to add Windows Server Container support to Azure Container Service in the future. During the initial stages of preview we ask that those interested self-nominate. You will first need an Azure Subscription, if you don’t have one yet then why not sign up for a free trial? Once processed, you will receive an email with information on documentation and support channels. In the meantime, take a look at our ARM templates for ACS using Mesos and ACS using Docker Swarm. Full public access will be coming in early 2016.